← Have You Been To New York City??? We were in 2016!! 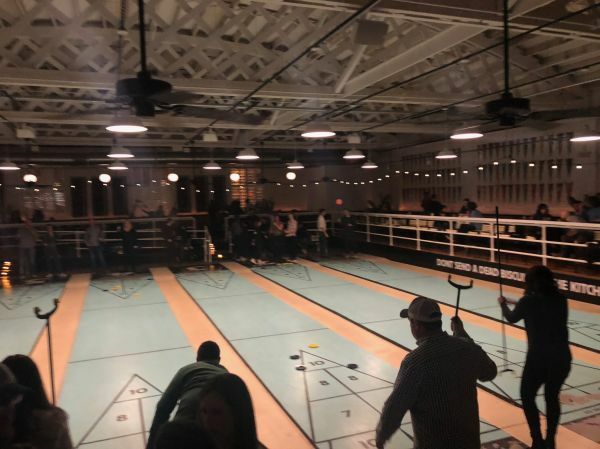 The Royal Palms Shuffleboard Club is making shuffleboard cool again in Chicago. Royal Palms is located in what looks like used to be an old warehouse. However, when you walk inside, it’s like you stepped into a tropical timewarp. The inside is light and airy with beach chairs throughout. It’s a piece of Florida in Chicago. The main feature you can’t miss though is the numerous shuffleboard courts running up and down the bar. Arrive early on weekends, because courts tend to fill up quickly. While you’re waiting for the court, there are plenty of activities including games like Connect 4 and Jenga as well as a photo booth. There’s also a different food truck each night. Drinks are reasonably priced as well with a pretty diverse offering of draft beers and specialty cocktails (all tropical themed, of course). Once your court is ready, someone will help teach you the basics of the game. It’s really easy to pick up, so Royal Palms is worth checking out even if you’ve never even heard of the game until this post. Who knows – you may discover you had a hidden shuffleboard talent!